The winner was a Mongolian runner, Ser-Od Ba-otochir in 2:19:05; the first woman was Joanna Bryce in 3:04:16. The first Seaford Strider home was Ryan Stewart in 2:54:54, 41st overall, and the first woman Strider was Natasha Swan, 397th in 3:24:54. Some are still running, so I'll update this with all Striders times this evening. And I should give credit to members of the Running Commentary forum who ran: see the 2010 Brighton Marathon thread, to Richard Wiles who ran to raise money for the Sussex Wildlife Trust and to old university friend and comrade, Tony Horrocks. There's an interesting data quality question raised by the results service. I had to look in two places for the Seaford Striders results, because the team name appears in two different forms. But that is nothing compared to members of our sister club, Brighton and Hove AC, whose name appears in no less than sixteen different ways. I think they need an authority file. From the marshalling point of view, I hope next time we'll signpost the pens better, and make entry into them easier. Runners are allocated coloured pens, according to their predicted finish time, as below. There were a lot of runners searching hither and yon for their pen, and the entrances to several of the pens were clogged with runners trying to get in. I rarely join the Seaford Striders for the evening club runs, but tonight was an exception, and with lighter evenings, we were able to start off road, up Seaford Head and then up Chyngton Lane, and round the path on the edge of the town, with High and Over in the distance. After Monday's effort at the Lewes 10k, and a day of strenuous involvement with my compost heap, I felt weak and struggled to keep up with the fitter runners, but it was an agreeable outing, nevertheless. The race was well summed up by @paulrobertlloyd as '4km slipping in mud, 3km swimming in bogs and 3km trespassing across fields'. I am under-trained at the moment, and had just shaken off an odd sinus affliction, so I did not find it easy, and finished in over an hour, a personal worst for the distance. Nevertheless, I enjoyed it. I ran through a great deal of mud and some boggy fields, which, for someone with my Fenland upbringing, held few terrors. I saw Iford church, a pretty Norman building in the style so common in Sussex. At the end I managed to find something to finish strongly, overtaking a few on the track at the end. And it was a day of light sunshine and agreeably stiff winds. I think I need to lose some weight. I wonder if an unrequited love affair might do the necessary? More regular training would do no harm. 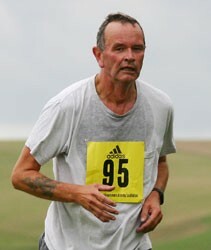 I cannot decide whether to run in tomorrow's Lewes 10K. I ran a short distance yesterday and am utterly exhausted. Last night, at 9.30, I could barely keep my eyes open. Mind you, I was watching a David Lynch film, Lost Highway, and Mr Lynch's plots are not always easy to follow.